In the typical hydraulic press brake the location of the hydraulic cylinders to move the beam is in lateral position i.e. side left and side right. The stroke of the hydraulic cylinders could be controlled with modern scales very precisely up to 0,01 mm. And the pressure is mainly goes on the line of the cylinder with independent control of the position. The center of the beam without the active force (mainly this is highly important with all the machines longer than 1500-2000 mm) and during the stroke of the cylinders is deflected because of material resistance. Under some sources the press brake deflection could cause around 0,15 mm/3000 mm difference in the center of beam against the lateral position. In other words the distance between beam and the table or press brake tools, i.e. the distance between die and the punch during bending is greater in the center of press brake than near the ends. This is typically normal condition and there is no way to eliminate it completely. The deflection is usually ignored only with small machines without lateral cylinders. This deflection can, for sure, effects the result of bending and differences between center and sides along the workpiece if it was bended for the full or nearly full length of the press brake. The deflection is connected with the loading so it means that the deflection occurs during the force loading. The amount or the value of the deflection is the difference between possible initial position without the load and the position during the loading. It is important to know that the deflection is happen not in the straight vertical position but effects the angle and the angeled result of the final workpiece. If the side result is 90 degrees the center will be more ("convex" or "canoe" effect) or less than 90 degrees ("concave" effect) because of deflection. There are various recommendations depends of the machine construction and should be provided by machine manufacturers. Somewhere are recommendations to follow the center of the machine, specially in high forces to prevent the skew of the beam due to the lateral bending. 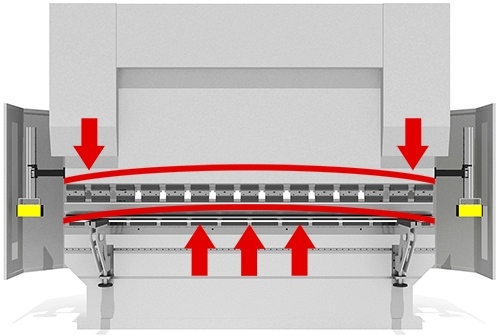 To perform the normal bending with the deflection problem the press brake uses the compensation or crowning system.